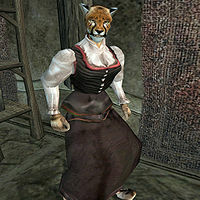 Chirranirr is a Khajiit thief who can be found at the Thieves Guild hideout in Balmora's South Wall Cornerclub. She offers medium training in Acrobatics, minor training in Security and Sneak, and has a mostly restocking selection of thieves tools for sale, though she cannot buy anything unless you buy something first, since she has no money to barter with. Chirranirr wears a common shirt, skirt, and amulet. Like all Khajiit, she can see well in the dark and can demoralize others for short periods, but otherwise knows no spells. If you ask her about Caius Cosades, she'll say, "The old greyhair gobbles sugar like scuttle. Chirranirr is surprised he still walks. But it doesn't affect him. That is the mark of a long-time user." This page was last modified on 14 March 2015, at 05:44.